MHJC entered the Yr 7 & 8 AIMS development team into an inter-school netball tournament in Papakura today. We are delighted to report that the team had an outstanding day on the court, winning all matches throughout the day and bringing home the gold medal for their ‘mixed’ section. 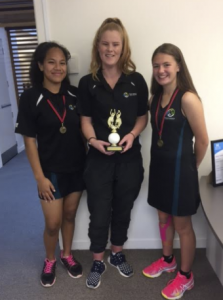 Yr 10 student, Tiana Herewini provided GREAT leadership to the team throughout the day, supported by staff members Olivia Young and Laetitia Jansen Van Rensburg.